Hello everyone, sorry it has been so long since my last post I just haven't been in the blogging mood. I'm not really in the mood to blog right now either but I will do it because I love you all. Not that my blogging is some great service to the world but you know what I mean. I just wanted to tell you all about my amazing husband and how he won my heart. This is a long story but its cute and worth sticking around for. Ok, so Jason and I met at church. He was sitting alone in the back of the church and I went up to him and asked if he would like to go to our youth group sometime. He said "No, I would rather be taught the Word." From all the experiences Jason had with church youth groups they just played around and never got into the Bible. Anyway, I didn't really give it much thought and just moved on. After a few months Jason and I became friends. There was a group of about 10 of us that hung out all the time. We went to movies together, the park, Wal-Mart, T-Peeing (you know who you are and we still love you all very much)! Anyway, Jason and I were always just friends until.... He decided to ask me out on a date! He invited me to go to Red Lobster with him and another couple, I said, "Of course." Then it was almost time to leave and I got scared so I called him to cancel. I did this to him a total of three times, maybe four I'm not sure. Poor guy he was so sweet about it he just backed off and we were just friends. I was doing a Bible study with a friend from church and noticed a Mothers Day gift that her husband and kids made for her. It had a few pictures on it and there was a verse from Proverbs 31. I think it said "your children shall rise up and call you blessed." I thought and prayed to myself, "Lord, it would be so cool to marry someone like that someone who would take the time to make a gift like that for me. " And that was it, I didn't really think about it much after that. A few months later Jason gave me a Christmas gift and told me not to open it until I got home. So I waited until I got to my uncles house (it wasn't too far from my house :) ) and I opened it. Jason drew me a picture and on the back it had Proverbs 31:10 "Who can find a virtuous woman? For her price is far above rubies." I started to cry and I told my family, "He would make the best husband, I just don't like him." 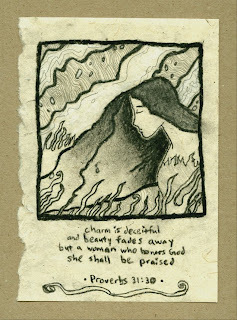 Then I turned it over and he had drawn a picture of a woman looking down and the scripture on the front was Proverbs 31:30 "Charm is deceitful and beauty fades away but a woman who honors God she shall be praised." It was such a beautiful picture, my husband among many other talents is a great artist. It was such a sweet gift and I loved it! A few weeks after he gave it to me I started to think about what I had prayed before about wanting a husband who would take the time to make a beautiful gift with Scripture on it for me. I started to pray and ask the Lord if it was His will that I married Jason would He please change my heart because I wasn't attracted to him and I didn't like him like that. We became best friends not long after that and we did everything together. I even helped him move. And it was while helping him move that for the first time I looked at him and thought, "Wow, he is cute!" and were married in March of 2005. Jason is the love of my life and I am so blessed to be able to call myself his wife. Oh and we are coming out in a wedding book soon, it's called Spectacular Weddings of Texas written by Jolie Carpenter with photography from our wedding by Margaret Lake. It has pictures from our wedding and tells the story of how we met and feel in love. Which I just told all of you. Oh great no surprise ending. Our M&M's were born one week ago today. Exactly one week ago today I was laying on the O.R. table looking at my sweet babies heart beating. Something I didn't know if I would have ever gotten to see. As I lay there holding and watching my babies breathe and watching their heart beating I was so thankful that they were born alive. God had answered one of our greatest prayer requests that if our babies weren't going to make it please let them be born alive. I just held them not knowing how long this moment would last but cherishing every second of it. We could see their heart beating at the top of their chests it was one of the most amazing things I have ever seen. Last night Kenya lay across my lap and fell asleep it was so sweet. I just happen to glance down and I could see her heart beating at the top of her chest. I just watched as her little chest moved up and down with every beat of her heart. I just praised God in that moment. Praise the Lord we have a healthy little girl full of life. When is the last time you held your children and watched them breathe or watched their heart beat? Is my baby in Heaven? This was a topic I was going to write about when we first heard we were having twins . I have always held the position that when a baby dies it goes to Heaven, but it wasn't until my Aunt delivered a still born earlier this year that I really dove into the subject to see why I held this position. There is not one verse that says "Babies go to Heaven" or anything like that, so a look at the entire scope of the Bible is needed to answer the question. Earlier this year (before my wife got pregnant) I became more convinced than ever, that when a baby dies it goes to Heaven. I came to this conclusion from many implicit references in the Bible (again there are no explicit references about this). I decided to give you the arguments and writings of one who has already written about this (no need re-inventing the wheel, right?). So I recommend the following resources to you from Pastor John MacArthur. "What about a two-year-old baby crushed at the bottom of the World Trade Center?" The question was fired at me by Larry King. I had been invited to participate as a panel member on the Larry King Live television program one Saturday evening. The program was taped in the aftermath of the September 11, 2001, attacks on the United States. Even though we had been discussing issues of life and death, grief and hope, as part of this program, Larry's question seemed to come out of nowhere. "Instant heaven," I immediately replied. Larry fired back a second question: "He wasn't a sinner?" I again answered, "Instant heaven." Larry's compelling questions revealed a nagging, troubling issue in the human heart. What is the future of a baby crushed by the rubble of the collapsing World Trade Center? What about any baby that dies? What happens to an unborn child, an infant, a child, or even a physically mature but mentally handicapped adult with the mental capacity of a child after he dies? What is the fate of that "little one" as he or she enters eternity? The questions are agonizing ones for many parents, Christians and non-Christians alike. A number of rather strange and ill-founded answers have been given to these questions in the past. The correct answer, however, begins very simply: "Instant heaven." In the sound-bite environment of a program such as Larry King Live, I had no opportunity to follow up with an explanation for my statement and, frankly, Larry didn't ask for one. He seemed satisfied with my quick and decisive response and went on to other questions related to the ways in which our nation was grieving and recovering from the aftermath of that terrible day of tragedy. After examining the Biblical evidence, Vanessa and I have been convinced that when a child dies they go to Heaven. This is consistant with the orthodox Christian view that we are saved by grace but damned by works. If you disagree, don't have a clue, or are not sure why you hold that position I would really recommend the above resources. I just wanted to do a really quick post and say thank you! Thank you to every who has been praying for us, and thank you to everyone who has blessed us financially. I haven't worked in about 13 weeks and we knew that we were going to have a lot of medical bills, but just like everything else I had a peace about it and I knew the Lord would take care of us. So I never stressed about money I just trusted God! With all that said thank you for letting the Lord use you in such a huge way to bless us! God has provided for our every need,... Blessed be His name! Also thank you all for your prayers! I'm feeling really good! The first time they made me walk in the hospital I thought I was going to die,...and I wanted to, it hurt so bad! But by the next day I was able to get around a little easier and then the next day it was a little easier. I'm always a little bit more sore in the mornings but through out the day it gets better. Oh and I can stand up straight! I know that sounds funny but it was really hard to stand up straight in the hospital I thought for sure that I was always going to be a little bent over when I walked, but not any more. Some more exciting news, I slept all night with out waking up for the first time in about 8 months. I woke up feeling refreshed and rested. So thank you, thank you for praying,...the Lord is answering prayers. Today was Melody and Madison's funeral, it was hard but so amazing at the same time. Melody and Madison's lives were celebrated and God was glorified! Margaret was there taking pictures,...so after I get them I will post them with all the details of the day. We love you all and are thankful for the place that God has brought us to. We are still at the hospital and should be out tomorrow morning. This has truly been a time of bittersweet providence. Click on view album ^ and it will take you to our Picasa page you will be able to watch the video on there. I just wanted to start out be saying thank you all so much for all the kind words yall left on our comments, the scriptures and prayers were such a huge blessing. We know that God is being glorified through this and we are blown away by His sustaining grace during this time. I wanted to share with everyone the events leading up to Melody and Madison's birth and all the events the day of their birth. It all started on November 9th I was having contractions all day about 10 an hour which normally would be alarming but was normal for me because of all the extra amniotic fluid. My doctor told me to expect contractions like that but if they got painful to come in. So onto Sunday night I had contractions all night strong ones that woke me up. This has never happened before so I started getting a little concerned. I decided that I would see what happened on Monday the 10th and wouldn't you know I have some pretty strong contractions that day as well. I didn't want to go to the hospital because I thought they we still just Braxton Hicks contractions. So I decided to go to bed and if they kept me up all night again then we would come to the hospital to be monitored. Do you notice a pattern here I think I'm a doctor : ) So Monday night I had contractions all night again they got so bad I finally just got up at 4am and took a shower and a bath trying to relax. Well it worked and my contractions had slowed down a ton. I had already said I would go to the hospital if they kept me up all night but now they were few and far between. At this point Tuesday November 11th I decided to quit playing doctor and see what my doctor wanted me to do. So I called and of course he wanted me to go to the hospital to be monitored. I felt so stupid for going because my contractions were not that bad anymore. My sweet husband reminded me that I call the doctor and they wanted me to come in I should not feel stupid about that. When we got to the hospital much to our surprise the same nurse was working that took care of us two weeks ago when we came. I think her name is Ashley I will find out and tell you for sure later. She is the sweetest person and I was so thankful that she would be taking care of me. She got me all hooked up to the monitors and I was still having consistent contractions every other one was stronger. So she checked me at about 1:00 pm and I was dilated to a 3 and 50% ephased. I couldn't believe it i was devastated. We were only 32 weeks along and I really wanted to make it to 36 weeks. She waited about an hour and checked me again I was dilated to a four. At that point my doctor called me and we talked for a few minutes about what the plan would be and he told me that we would be delivering that day. I lost it over the phone I couldn't even get words out of my mouth. I love my doctor he was so sweet he just kept saying I'm so sorry about this. I asked Ashely (the nurse) why wouldn't they try to stop my labor. She said if I wasn't in active labor that there were some things they could do to stop it but since I was in active labor there was nothing they could do. My body just thought it was time to deliver. I'm glad she explained that to me. Our family and a few close friend started showing up around 4pm they helped time to pass by pretty quickly. The Photographer that we used at our wedding came to take pictures for us. It was so amazing because Jason and I could just be in the moment and not have to worry about missing anything. Margaret (our photographer) got to the hospital and stayed with us until around 10 so that she could also get pictures of Jason parents with the babies, they got into town around 9pm. She did this all for free and every time I would tell her thank you she would say don't think me I'm just serving the Lord. Margaret thank you so much for everything I know that you were serving the Lord by taking those pictures but you will never know how much that meant to us! We love you and truly appreciate it! Here is her website http://mlakephotography.com/ if anyone needs a GREAT photographer. She is working on the picutes now but I can't wait to get them and put some on the blog. My older sister Brandi wasn't planing on coming into town until Saturday but a close friend of her husband's family had died she she drove into town early to be with his family. Please be praying for his family. God providential hand was at work through this whole day and pregnancy. That was such a huge blessing for both of us that she was able to be here. Through out the coarse of the day all the doctors came to see us to make sure we were all on the same page as far as the delivery and we were. I was so scared of having a csection I have thought about it for the last 13 weeks. I kept telling Jason there has got to be some other way we can get them out. Of course there wasn't though. At about 6pm they took me back to the OR and started prepping me for surgery. The spinal hurt pretty bad but they put this new pain med into my spine and it's lasts for 24 hours. Can you believe that? I didn't feel any pain from the surgery until about 12 hours later and even then I wasn't bad. I didn't get more pain meds until about 10 the next morning. Oh and the best part is that it doesn't go to your head so I was alert the whole time. So I'm numb at this point they brought Destinee (my 15 year old sister that we have custody of and Jason into the OR. She wants to be a NICU nurse so this was a big deal to her that she got to be in there. She watched to whole thing. I didn't even know that they had started until she told me. Which was good because I was so scared that I was going to feel it but I didn't even know he had started until they were half was done. She was so cute she was giving us a play by play. She was saying this is the coolest thing ever, oh they are pulling them out, oh they are so cute. As soon as the babies came out at 6:24pm Jason and Destinee went over to the warmer to see and take pictures of them. I forgot to tell you remember the nurse Ashley that took care of us earlier in the day well she surprised us and was able to be in there for the delivery. It's crazy how fast you can form a bond with someone in such a short amount of time. Thank you Ashley you were a huge blessing. She stayed with me while Jason and Destinee were looking a the babies. I asked the hardest question that I have ever asked in my life "are Melody and Madison alive?" She said "yes and they are moving around." I couldn't believe it they came out alive! The girls lived for about and hour and peacefully God took them home. That was such a huge answer to prayer we wanted to spend time with them while they were alive. They stayed with us the whole time. two little babies joined together. Jason, Destinee, Kenya and I spent some time with the babies and then we let the family and friends come in a few at a time. I wasn't sure if we were going to let anyone hold them but we did. It helped me a lot to see other people loving on them I know it helped our families to get to say good bye. The nurse we had after the babies were born was so wonderful you could tell she had dealt with parents losing their child before. She included Destinee in everything. They gave them a bath together, did their feet and hand prints, put on diapers and got them dressed. After Jason's parents and brother Uncle Toe Toe got to spend some time with them we decided it was time to let Melody and Madison go (meaning leave our room). We asked everyone to step out of the room so it was only Jason, Destinee, Kenya, Melody and Madison. Next was one of the hardest parts of the day we let Kenya hold them and we explained to her that Melody an Madison were not going to be coming home with us, that they went to live with Jesus and this was the last time we were going to see them here on this earth, but when we get to heaven that they would be there worshiping God. What an amazing thing to be in heaven no pain, no sickness, just worshiping God. He is so worthy of our praise! BLESSED BE THE NAME OF THE LORD! After that Destinee and Kenya went back to our house with Rose, Tony and Uncle Toe Toe. They are going to stay with us for a while to help out around the house, and with Kenya. So next to the second hardest part of the day we paged the nurse and told her we were ready for her to take them. After that both Jason and I lost it. We just held each other and cried our eyes out for a while. Then we were ok God just gave us a peace that passes all understanding. We were both able to fall right to sleep after that. Although yesterday was one of the saddest days of my life it was also one of the most amazing days of my life. I can't even think of a way to put into words what it felt like to be comforted by the Lord. God is so good and although our babies are no longer with us God answered so many prayers along the way. Glory be to God alone! As he [Jesus] passed by, he saw a man blind from birth. but that the works of God might be displayed in him." Doctor after doctor has come in and told us what they will be doing (the prep, surgery, anethesia, ect,...) And we are thankful for the team working with us. We have local close friends and family coming over to visit, my parents from El Paso, my bro (Uncle Toe Toe) from Austin, and our pastors from Sovereign Joy Community Church, so we won't update for a while (or maybe my bro will). After alot of crying, cause we wanted to make it to 36 weeks to deliver (cause that is when we know they would have lungs, we are 32 weeks), my wife is getting the twins clothes ready and looking forward to seeing them. I really don't know what to think right now,...lots of mixed emotions. All I know to do is pray and be there for my wife no matter what happens. Thank you for your prayers, we love you all. p.s. The lady in red is Margaret Lake, she is graciously taking free pictures for us (we used her for our wedding and some family stuff, she is great). This is such a blessing cause this will allow us to spend time with the babies and each other and not have to worry about pictures. The doctor has said that Vanessa will be having the babies tonight. I will be driving into town tonight. So no updates for the next three hours. Please pray for Jason and Vanessa. My heart is heavy. Pray for the extended family as well. Does anyone want to pray and worship outside of the hospital tonight? Say 9pm? Text me. 817-308-1349. From my heart, to God, creator, designer, engineer of all below and above. Vanessa is now at 4 cm and the doctor has said that she will be delivering today. Jason and Vanessa are at the hospital right now. She has dilated 3 cm and her cervix is 50% ready to deliver. They are waiting to get back more test from the doctor. I will post more information as it becomes available. Please do not call them. Please leave the lines open for family. Feel free to text them with encouraging words. Kenya had a mullet that would put Billy Ray Cyrus' to shame. So it was time to cut it off. I was a little worried about how she would do. I really thought she would be screaming and throwing a huge fit but she didn't mind it at all. I don't think she had any clue that she was getting a hair cut since there was a princess movie on right in front of her and she was pretending to drive a fire truck. Remember the death stare? Well it's back. This had nothing to do with getting her hair cut though it was what she was watching on t.v. She would be smiling and laughing one minute then she would give this awful look. The BEST death stare EVER! Well, here is my belly at 31 Weeks, 5 Days, 161 pounds and 44 inches. We went to the doctor today (we will be going once a week from here on out) they did a quick sonogram to measure my amniotic fluid and it turns out it is still very high. My doctor told me he doesn't think I'm going to make it to 38 weeks, so now we just take it a day at a time and see how long we can keep these babies in there. He is guessing that I will deliver after Thanksgiving. Of course, the Lord is the only one that knows when M&M will make their entrance into the world. Please be praying that I will not go into preterm labor, we really want to make it to at least 36 weeks (this is when the babies lungs should be developed, if they have lungs). So there you have it thanks for keeping up with us! Did you guess an M&M, or maybe even my belly? Well you were right. Antonio (Uncle Toe Toe) and our buddy Curt always call the babies M&M so we thought it was only fitting to decorate my belly as an M&M. Jason did a great job!